Honey Dipp was created in 2004 by best friends Dionne McKay and Mickella Sealey. They come up with the idea after reminiscing about their childhood and the natural products they used as kids. Both their grandmothers had used moisturizing blends of aloe and coconut oil for dry skin and bath salts for aches and pains. It was then their idea was born for creating their own line of natural products influenced by their Caribbean roots. They created their product line using exotic blends of Fresh Papaya, Citrus, and Sugar Cane with the natural ingredients of aloe, coconut and palm oil which have become key ingredients in their exclusive collection of bath and body products. I was given the opportunity to try five Honey Dipp products- Coconut Lime Body Lotion, Citrus Burst Brown Sugar Scrub, Citrus Glow Body Butter, Fresh Papaya Honey Bun, Island Burst Honey Bun and Shea Mango Honey Bun. I was so excited to receive the package in the mail and couldn’t wait to give them a try. The Coconut Lime Body Lotionis an exotic blend of coconut and freshly squeezed lime and is both creamy and luxurious. This lotion smells sooooooo good! It smells just like heaven. It was just such a pleasure to lather it and enjoy how nice it felt to wear. My arms and legs get dry so I used it mainly on those two areas and I found it absorbed very easily into my skin and was also not greasy at all. It’s not a thick heavy lotion, but one that spreads easily and a little goes a long way. My cousin Allison also tried this lotion for a couple of weeks and told me tell everyone that it is her “all-time favourite” and she would absolutely use it again. She thought everything about it was wonderful and loved its exotic smell like I did. 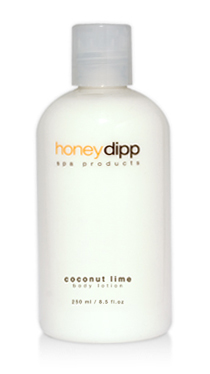 The Coconut Lime Body Lotion retails for $22 on the Honey Dipp website. The price is pretty good for the quality of product it is. Both Allison and I would buy it. Another product I tried was the Citrus Burst Brown Sugar Scrub. It contains brown turbinado sugar blended with sweet orange blossoms. 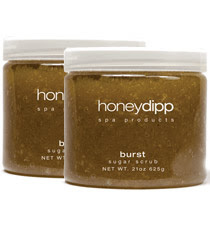 It had a really refreshing and unique scent that I loved and it was another top notch product by Honey Dipp. You definitely feel like you are pampering yourself when you use this scrub. My skin was so soft after using it in the bath. It’s cost is $40 and you don’t need to use too much to get the desired effect. 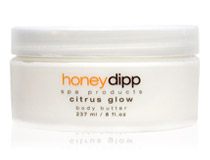 The Citrus Glow Body Butter is another delightful product made by Honey Dipp. It’s described as having the aroma of freshly squeezed oranges, juicy Clementine, ripe mango and papaya to refresh and awaken the senses. This is another product that after you put on you can’t stop smelling yourself! I really enjoyed using it. I wanted my aunt Lori to try it out because she has extremely dry skin and has tried numerous creams so I wanted her take on it. She said, “This product moisturized my skin very well. I didn’t need to use very much on my skin as it spread very well. Also loved the smell.” The price of the Body Butter is $24. And lastly, I got to try three different samples of soap which are called Honey Buns. These are unique two in one product: a natural sea-sponge to gently exfoliate that is embedded in moisturizing glycerine soap. They have three types of Honey Buns- Fresh Papaya, Island Burst and Shea Mango. They all smelled wonderful and reminded me of being on a tropical island. All worked equally as well so it’s too hard to pick one as a favourite. I tried, but I kept changing my mind! The soaps lather really nicely and didn’t dry out my skin. You don’t even really need to moisturize after using it. The sea-sponge soap was a little different than anything I had ever used before, and at first I wasn’t sure about it. After trying it a few times, I ended up really liking it. Very unique for sure! Each soap retails for $16 which would be expensive for a typical soap, but Honey Buns definitely aren’t your average soap. I love Honey Dipp! These are fabulous products! To purchase, please visit Honey Dipp online.